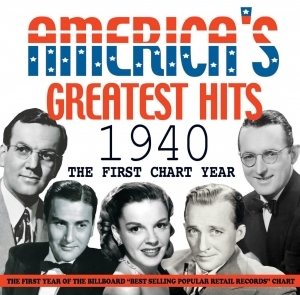 Acrobat’s highly popular “America’s Greatest Hits” series has so far focused on the 1950s and ‘60s, but there is a clear demand for collections which address earlier years, and so this collection starts at the very beginning of the 1940s with what was the very first year of the record sales charts. In July 1940, Billboard began to publish the "Best Selling Popular Retail Records" Top 10 on a weekly basis, and this collection comprises every record which appeared in that chart from July through to December of 1940. Inevitably, it includes records by a number of the top swing orchestras of the day including Glenn Miller, Tommy Dorsey, Artie Shaw and Charlie Barnet, along with their featured singers, notably Frank Sinatra’s early hits with Tommy Dorsey, as well as hits by top vocalists like Bing Crosby, Judy Garland and Ella Fitzgerald. Alongside those are doowop records by Ink Spots, and some fine boogie-woogie hits as well, and the 47 titles featured make up a great-value 2-CD set which provide an entertaining snapshot of the dawn of the chart era. Once again, there are detailed background notes on every record in a 5,000 word booklet. 7 Pennsylvania 6-5000 Glenn Miller & His Orch. 9 Sierra Sue Bing Crosby with John Scott Trotter & His Orch. 24 Only Forever Bing Crosby with John Scott Trotter & His Orch. 7 Pompton Turnpike Charlie Barnet & His orch. 16 Ferry-Boat Serenade (La Piccinina) Andrews Sisters with Vic Schoen & His Orch. 20 There I Go Vaughn Monroe & His Orch.